These natural punched tin half star ornaments are a joyous addition to your holiday or special occasion decorations. These make wonderful Christmas tree ornaments and also make great stocking stuffers. 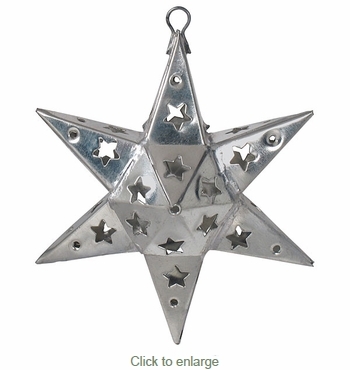 All of our punched tin half star ornaments are hand punched and cut by Mexican folk artists. Expect some variation in size and finish on these uniquely designed tin ornaments. Sold in pairs. Price is for 2 star ornaments. Use the quantity box for the number of sets of 2 you would like to order.